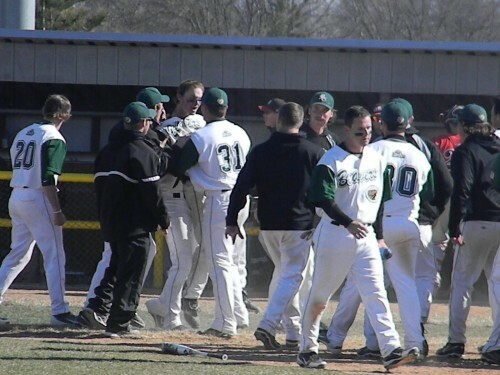 Thanks in large part to a walk off single from sophomore infielder Dylan Webb, the Bemidji State baseball team was able to salvage a split with No. 8 St. Cloud State Wednesday at the BSU baseball field. The Beavers overcame a four run deficit in the final two innings of the first game to earn the 5-4 win, but fell short in the second game, in a 12-5 loss. After being shutout for the first five innings by SCSU pitcher Kyle Fischer, BSU scored three runs off of the Huskies bullpen to cut the deficit to 4-3. St. Cloud (23-8 8-4 NSIC) hurt its own cause in the inning with two costly errors. Travis Purvis and Jaryd Marks each singled in the seventh and the Beavers had runners on the corners with two outs. Mauricio Gomez delivered with a single to right field to tie the game. With two strikes on him, Webb followed with a bloop single in short left field to score outfielder Juan Molero and the Beaver bench rushed out to celebrate the win. Phil Bray (7-1) was the winning pitcher for the Beavers. He pitched the one inning in relief and struck out one. Marks started for BSU; he allowed three runs, two earned, on four hits in six innings. He struck out three and walked six. Scott Lieser (6-3) took the loss for the Huskies. He allowed two runs on five hits in 1.2 innings. Kyle Fischer was their starting pitcher; he tossed five shutout innings, allowing four hits while striking out six. The Beavers fell behind 6-0 early on in the second game and weren’t able to recover. The lead was cut to 8-5 heading into the ninth, but the Huskies responded by scoring four runs in their half of the ninth to seal the victory. Ross Stein (0-1) took the loss for BSU. He allowed six runs on seven hits in 4.2 innings. He walked four and struck out two. Shawn Riesgraf (5-0) picked up the win for the Huskies. He allowed two runs on five hits in five innings. He struck out three and did not walk a batter. Bemidji State (14-14 7-7 NSIC) returns to the diamond this weekend for a pair home doubleheaders with Augustana. Games on both Friday and Saturday are scheduled to start at 12 and 2 p.m.